Arquiste is a beautiful fragrance collection that was created by an architect, named Carlos Huber, who specialized in Historic Preservation. For this reason, each fragrance in this line was created with meticulous research, authentic sources, and rare ingredients to evoke specific moments in history. It could be said that each scent is a time capsule that invokes intimate memories and dreams, and opens doors to distant words. One of my favourite feminine fragrances in this collection is Flor y Canto. Rodrigo Flores-Roux created this specific scent for Carlos Huber. “On the most fragrant festival in the Aztec calendar the rhythm of drums palpitates as a wealth of flowers is offered on temple altars. Billowing clouds of copal (incense) act as a backdrop...” Flor Y Canto transports you back to a very fragrant Aztec festival in the pre-Colombian Tenochtitlan in 1400. I love the balance between delicate yet exotic ingredients in this fragrance. Flor y Canto opens with a lovely and romantic Mexican Tuberose. This is a very soft note and is not too overwhelming. Next you can smell notes of Plumeria, which adds an exotic edge. The Magnolia in the fragrance has a very rich presence along with a very green note of Golden Marigold – a secret Aztec flower. The notes in this perfume are reminiscent of the ancient Aztec garden and create a long lasting memory. This cool fragrance is powerful and long lasting yet feminine on my skin. If you like white floral fragrances, Flor y Canto may be the one for you! I've realized that it has been a while since I’ve written about perfumes! Things have been a bit hectic and coffee has been taking priority over fragrances, but it’s always important to stop and smell the flowers (or perfumes). 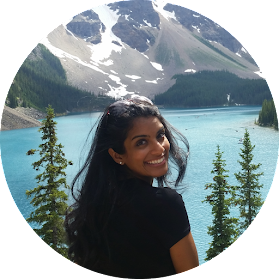 I’ve decided to start Fragrance February and this post will be the first of the series! 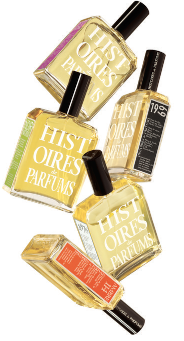 Histoires de Parfums is a gorgeous line from France founded in 2000 by Gérard Ghislain. The creator was inspired to choose the name “Histoires de Parfums” because he wanted to create stories and ultimately dreams through fragrances. Although he was not a writer, he decided to create stories through fragrances and called the ‘essence’ his ink. Inspired by his travels and his childhood in Morocco, Gérard has created twelve rare and delicate scents. Together, these twelve fragrances create a library that tells a unique story about famous characters, raw materials and mythical creatures. The first collection includes 8 fragrances (1876, 1873, 1826, 1804, 1828, 1740, 1725 and 1899), which are all based on influential people. Each fragrance is named after the chosen person’s year of birth. The second collection (Noir Pachouli, Blanc et Violette, and Vert Pivoine) tells stories based on flowers and plants in a very unique and personal style. Other notable collections include unique cult perfumes (1969, Abre 114), the Tubéreuses collection, Moulin Rouge, Olymia, and the Rare Edition Collection (a blend of vegetables, minerals and animals). Gérard created this fragrance to symbolize delicacy, purity, innocence and peace. The subtlety of this fragrance is what I love most. The stages of the scent change throughout the day but it certainly lasts for a long time. If you are a fan of soft, delicate and sophisticated scents you will love Blanc et Violette. Shop Histoires de Parfums at etiket.ca.